Warmer waters. Melting ice caps. Disappearing glaciers. They are all expected to raise ocean levels by 39 inches in the next century, forever reshaping Hawaii. » Honolulu Stadium park in Moiliili. That's using the projection of one meter, or 39 inches, of sea level rise, a figure many scientists and planners who have reviewed global climate change predictions say is likely for Hawaii. Specific projections for areas less populated than urban Honolulu haven't been made, but every island would be affected by climate change in one way or another. Marine geologist Charles "Chip" Fletcher uses a yardstick to show what could be the approximate sea level at the Ala Wai Canal in 100 years. "I think this is a slowly emerging catastrophe," Fletcher said. "I think it's going to slowly dawn on us." Generally, the more gently sloping land is, the farther inland the new sea level will reach, said Mike Field, a U.S. Geological Survey marine geologist. "I think 1 meter is a reasonable number," Field said. "Most people agree there is an increase in rise now and that the rate of rise is going to increase over the next century -- conservatively half a meter, more realistically half a meter to a meter." Said Douglas Tom, manager of the state Coastal Zone Management Branch: "It's a subject that's been on the minds of many different people in many different agencies." In the next 100 years ocean levels are expected to rise 39 inches due to global warming. Here is what Waikiki could look like, according to researchers at the University of Hawaii-Manoa. Chip Fletcher is a marine geologist at UH who studies coastal changes caused by climate change. Projections show the ocean water level will rise about three feet in the next 100 years. 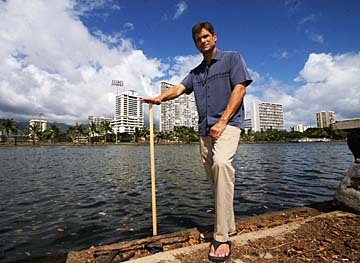 Fletcher places a meter stick at about the high water mark on Waikiki Beach to illustrate the eventual water level, which would submerge this beach scene. It doesn't have the sudden terror of a tsunami or a hurricane. 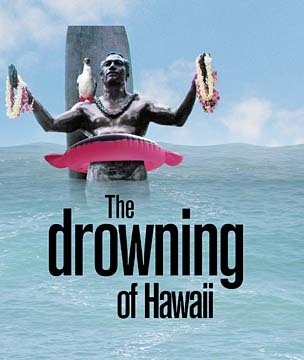 But the sea level around Hawaii is expected to rise 39 inches by the end of the century. It will come slowly. And once it comes, the water will stay a long, long time. 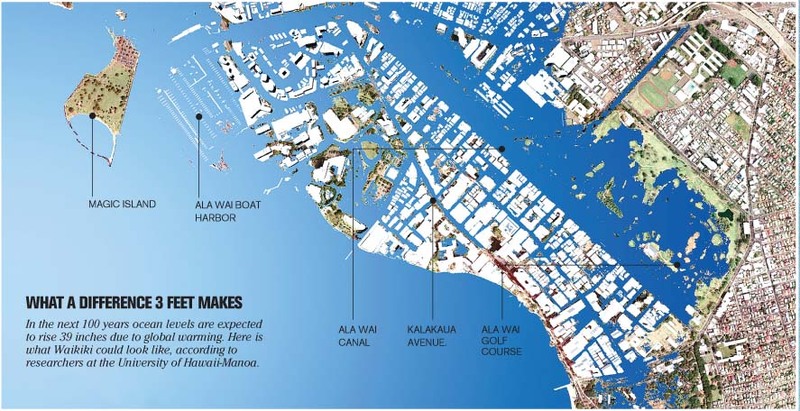 It will submerge the Ala Wai Boat Harbor, the Hilton Hawaiian Village Lagoon, the banks of the Ala Wai Canal and most of the Ala Wai Golf Course. Magic Island will be an actual island. Industrial sites at Campbell Industrial Park will have water lapping at their foundations. Beaches will be going, going and gone. Coastal communities throughout the state will be forced to move, raise and abandon buildings and roads that are too close to the rising waters. "I think this is a slowly emerging catastrophe," geologist Charles "Chip" Fletcher said. "I think it's going to slowly dawn on us." And this amount of sea level rise is coming, Fletcher said, even if the world takes quick action to slow global warming, because the climate changes are already in motion. With worldwide action to slow global warming, "I think the potential exists for us to stop it at a meter or a meter and a half," he said. 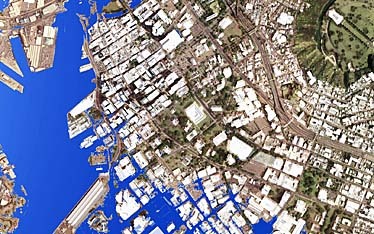 Fletcher's University of Hawaii research team has created aerial maps that depict downtown Honolulu, Waikiki and Kalaeloa as they would look with a one-meter rise in sea level. The first signs of the change are already here. During a monthly high tide, "go to Coral Street or Mapunapuna or in Waikiki and pull up a manhole cover and you'll see salt water less than a foot below," Fletcher said. On Nov. 23, the highest tide of the year, Fletcher predicts sea water will flow out of storm drains on the sides of Ala Wai Boulevard. "That's going to be the first sense of sea level rise that most people have, pools of water pool around storm drains," Fletcher said. "And if it rains on top of that, rainwater has nowhere to go, so it will puddle." A view of downtown Honolulu in 100 years when ocean levels are expected to be 39 inches higher. Like the low spot on Mapunapuna Road that periodically floods when high tides and heavy rains converge. Unless there are engineering projects to avert it, such places will become what Fletcher calls "urban wetlands" in coming decades. "If you look at this map of Waikiki, it's quite obvious that Waikiki at high tide, several decades from now, or at end of the century can't exist the way it is right now," Fletcher said. Ditto for coastal highways in places where they have been flooded by high surf every couple of years. That will start happening several times a year, agreed Cheryl Anderson, director of the Hazards, Climate and Environment Program at the UH's Social Science Institute. Government agencies are in the early stages of "working with development plans to think about what these changes might mean," Anderson said. The 2007 draft revision of the state's Hazard Mitigation Plan, a document required by the Federal Emergency Management Agency to get federal disaster aid, has a new section on climate change, including sea level changes, Anderson said. In addition to speeding beach erosion, the higher ocean could also more frequently overtop protective reefs during storms -- making wave run-ups go even higher. "The good news is that it's still a ways off," said Bruce Richmond, U.S. Geological Service specialist in coastal hazards. "We can start to plan for this when we build new highways and construction." "We're looking at a long-term phased retreat from the coastline," Richmond said. "It starts with zoning and setbacks, so that large expensive public buildings are not put right on the water's edge." Insurance policies that allow rebuilding of damaged structures will have to be re-examined. "There's plenty of time to adjust to this," Fletcher said. "If we are proactive, we can really begin to get a handle on this problem." » Waikiki hotels include sea level rise countermeasures when major renovations are undertaken. » Somebody drill dozens of test wells in downtown Honolulu and Waikiki to locate the water table and forecast where its rise with the ocean level will cause problems. » Too-close-to-the-ocean highways be shifted mauka to avoid the rising water. The state Transportation Department is aware of the sea level rise trend, but is dealing with it by addressing coastal highways that are suffer from high surf erosion now, spokesman Scott Ishikawa said. » In the coming decades, the rising water table will form permanent wetlands, including in urban areas, from which rainfall and storm runoff will not drain. » Heavy rain, such as in the winter of 2006, will cause flooding lasting weeks. » Erosion of beaches and other non-rocky shorelines will accelerate. » High waves will increasingly damage roads and communities near the coast. 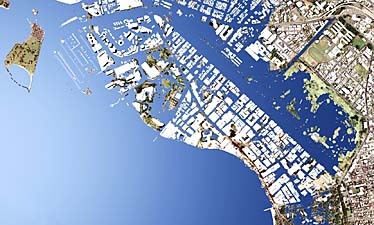 » Sea level rise will magnify the effects of storm surge, hurricanes and tsunamis, causing more damage farther inland. A recent example of a fix was the Kalanianaole Highway at Makapuu. On the drawing board for possible movement inland are the Laniakea area on Oahu's North Shore, the Honoapiilani Highway south of Lahaina, and the Hilo Bayfront Highway, Ishikawa said. The department also is studying trouble spots on the Kamehameha Highway on Oahu's Windward side, he said. Hilo's pull-back from the ocean after the 1960 tsunami exemplifies changes that eventually might have to be made at vulnerable spots, Anderson said. Eileen Shea, director of the NOAA (National Oceanic and Atmospheric Administration) Integrated Data and Environmental Applications Center, praised Fletcher's map as a "a first blush snapshot" that should lead to more in-depth study. "You and I aren't going to feel the average sea level rise," Shea said. "What we're going to see is how they're going to affect extreme events," because even a few inches of higher sea level can magnify the bad effects of hurricanes and high surf. "We don't want to create a panic, but we need to make everyone aware that it's something we need to plan for in the future," said Sam Lemmo, administrator of the state Office of Conservation and Coastal Lands. » Studies of coastal erosion trends have been completed on Maui and are ongoing on Oahu and Kauai. These are used to determine how close to the coast new buildings are allowed. » The U.S. Geological Survey could begin new studies soon on the effect of sea level rise on coastal areas, including Hawaii. » Congress will consider requiring states to conduct climate change planning. Web sites rising seas predicted and global warming.